Illegal downloading is prominent type of copyright infringement. Do you know that some applications used for downloading actually turn your computer into a server, allowing it to be used for the distribution of copyrighted information? For information regarding the University’s stance on illegal downloading, please see A Note on Illegal Downloading. For copyright infringement information, please see the following NYU KnowledgeBase article: Copyright Infringement FAQs. Please be advised that portions of the internet are currently under a denial of service attack, and may be unavailable. This includes at least NYU Box. Box and many other Internet services are working on controlling this attack and making their services available. To see which NYU services are impacted, and to monitor service status, please click here. and has known and familiar elements, it is spoofed. When you hover over the link (in the received message), what displays is: http://shibboleth.nyu.edue.in/idp/profile/SAML2/Redirect/Loginpage.php? 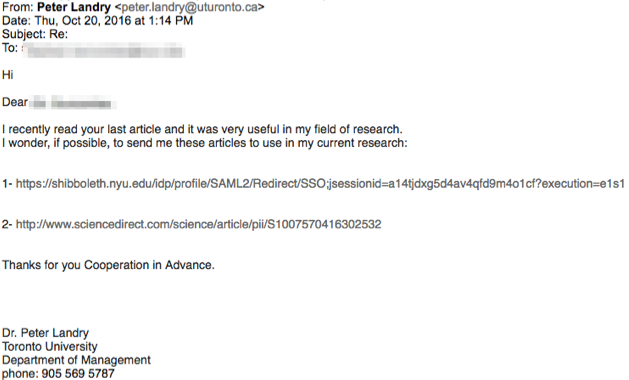 Please note that what you are looking for is https://shibboleth.nyu.edu and other variants indicate a malicious link. Immediately reset your password. Please see Changing your NetID/NYUHome password for instructions. Please also be advised that the company hosting this particular link has been contacted, and the link has been taken down. Limit the information you share on social media sites. Information shared on these sites can be used to target you, your place of employment, or people that you know. For example, a targeted phishing attempt, a/k/a spear phishing, may be designed to target you or someone that you know, as a result of information gleaned from social media. Use your phishing detection skills and knowledge to examine e-mail received and avoid phishing scams. 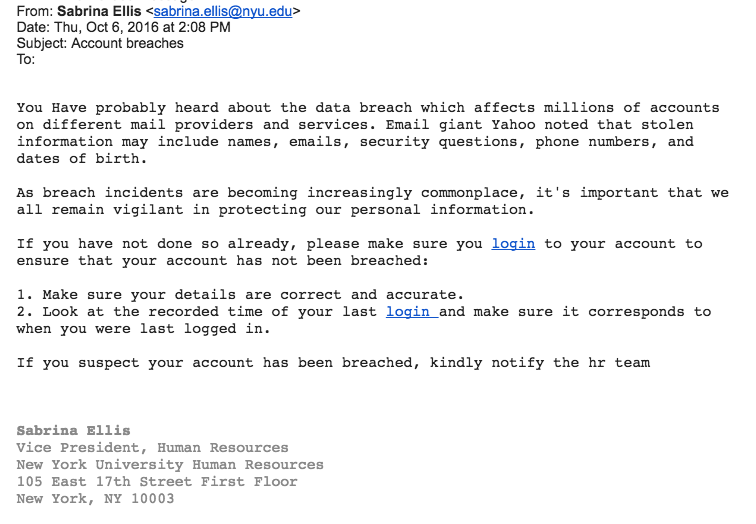 To view a NYU Knowledge Base resource on detecting phishing messages, please click here. For more information on targeted attacks, please view the following SANS video of the month which will be available for viewing throughout the month of October. For more information on social engineering and how you can protect yourself, please click here. Please report suspected social engineering scams to security@nyu.edu. Did you know? October is National Cyber Security Awareness Month (NCSAM)! The goal of NCSAM is to promote awareness of the information security risks and threats we face daily. The themes we’ve chosen for the month are ransomware, and passwords. Please visit our Security Awareness page for more information, and links to resources. What can you do to improve your individual information security posture? Learn essential security tips, and access related information security resources by taking the Individual Technology Security Tech Savvy elearning module! This module is available to faculty and administrators on iLearn. NYU’s Office of information Security is here throughout the month (and beyond) to provide you with the latest tips and tutorials on how to protect yourself and your information online.